A short time ago over on the Whitebox GAT listserv someone asked an excellent question. They asked whether there was such thing as a Whitebox GAT User’s Manual, since the transition to Whitebox GAT, when you’re coming from an ArcGIS background, can be a little difficult. Often there are corresponding tools in Whitebox GAT to those in ArcGIS but they will frequently (and sometimes frustratingly, I’d imagine) have different names. There are different workflows for doing similar tasks and in general you can feel a little like a fish out of water for a short while until you get use to the Whitebox GAT way of doing things. I can certainly understand this perspective. To date, I’ve been the main contributor to the Whitebox GAT project and so it reflects my design decisions more than anything. And, let’s face it, I’m a little different. As I pointed out to the question asker, I have never in my past had a time when I have used ArcGIS on a day-to-day basis. I’ve used IDRISI extensively many years ago (and that fact is apparent in some aspects of Whitebox in the way certain things are done) but frankly I’m just not that familiar with ArcGIS. It doesn’t inform how I have developed Whitebox to a large extent. 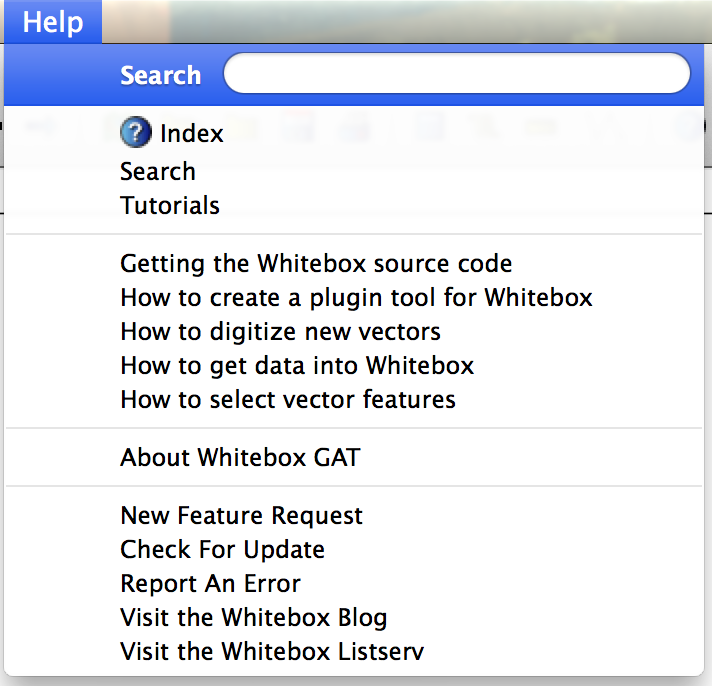 Notice, that list starting with ‘Getting the Whitebox source code’? I’m not sure to what extent this feature has been taken up, but it’s there. If you have any suggestions for other additions let me know either by emailing me or leaving a comment below. If you have any Whitebox GAT tutorials that you’ve created yourself and would like to donate to the project, also please let me know. But this gets me to the main point of this blog. What I would like to do is offer a brief tutorial on the topic “Whitebox GAT for ArcGIS users“. It can be loosely formed as a list of common gottcha’s or ‘Them vs. Us’ comparisons. But as I’ve said above, I really don’t use ArcGIS, so I need to ask for your help. If you’re a Whitebox GAT user and are coming to it from an ArcGIS background, can you provide us with a list of the main difficulties you experienced when you first tried using Whitebox? We’re looking for some of the things that you had to spend time trying to figure out how to do. Wouldn’t it be great if you could help to make that transition a little easier for future Whitebox users? I’m a big believer in the idea of paying it forward. Leave your comments below and, as always, best wishes and happy geoprocessing.